Giddy Greetings: One Year Blogoversary Blog Candy! One Year Blogoversary Blog Candy! I cannot believe that on Saturday 10/24/09 my one year anniversary of my blog is going to take place! Since I have gone through all of the months and seasons on this blog I thought it would be fitting to give something away that has to do with that. 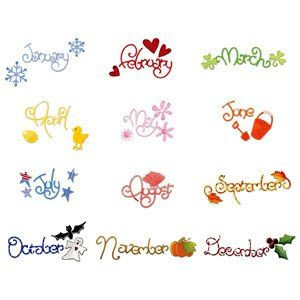 It's a set of Sizzix 12 Die Calendar Set! The dies are also in a plastic storage case! You can use them with Sizzix or Cuttlebug machines. Here's a photo of what each die has. That's it! I'm sneaky so I will sneak around and see if all is done. I will chose the winner on November 4th using Random.Org. International bloggers can also join in. Happy Blogoversary to me! Good luck to you! I now below to both of your groups! Both look very interesting. I don't have a blog of my own so can I post to my twitter account or my facebook account to equal # 3 on your list? Awesome candy!!!!! I hope to be the lucky winner! Thanks for the chance to win! Linked candy on my blog and I'm a follower on your blogs..
Hello Monica! congratulations on your blogoversary!!! Already follow both! Congrats on your blogoversary!! Posted candy on my sidebar. Thanks for the opportunity to win this fantastic blog candy. Congratulations!!!! This is wonderful. I am so happy for you...... That candy look really good to me. Yay, Monica! Congratulations!! Wow, you sure have accomplished a lot in that year!! I am so happy for you! Blessings to you! Woo Hoo! Happy Blogoversary to you! I did all 3! and will try to post about it within the next day or 2! Great giveaway! I did all 3! Congratulations on I year blogging! congrats for finishing one succesful year. Many congratulations on your anniversary! Happy Blogaversary, Monica! Thanks for the chance to win your great blog candy. I'm following both of your blogs and have linked you on my side bar. Happy Blogoversary!!! Thank you for a chance to win your yummy blog candy. I linked you on my side bar. Hi from Italy, Monica, happy blogoversary and thank you very much for a chance to win this fab candy! This would be very useful to me, because I love to create diaries! I've jut put a link to my candybar and get fingers crossed! Happy Blogoversary!I am a follower, I linked you on my side bar. I am a follower on both blogs and I posted this on my blog also. I was checking out your other blog and I sure do like what I what i seeing and wiill have to check it out it ouit even more. I do check this blog all the time. love the quilling and everything. thank you so much. happy blogoversary to you and thanks for the chance to win this fab candy, I've become a follower of your lovely blog and put a link to your candy on my sidebar. Happy blogversary. Thanks for the chance to win. I have put a link in my blog and become a follower of your two blogs. Happy blogaversary!!!! What a lovely candy! Thank you for the chance to win. I have joined you in your both blogs and posted the link to my side bar.